Twenty years ago today Arsenal beat Crystal Palace in the first leg of the Coca Cola League Cup, to stay on course for a unique (at the time) cup double. The match featured two penalties, one for each side and both converted, plus two Alan Smith goals to give Arsenal a 3-1 advantage for the second leg. Ian Wright opened the scoring from the spot after ten minutes, his 46th goal in 63 Arsenal matches. Arsenal were 2-0 up after 21 minutes through Smith and cruised to a 3-1 victory. This set up the prospect of a comfortable home second leg for Arsenal, but perhaps the more interesting story of the week came a few days before when Martin Keown re-signed for Arsenal. The still boyish-looking Keown returned to Arsenal after nearly seven years away in the wildernesses of Everton and Aston Villa. George Graham paid £2 million for a player he’d sold for £200,000 just a month into his Arsenal reign. Everyone knows the story of Ashley Cole and his £5,000 a week – Keown wanted an extra £50 a week and George wouldn’t give it to him! Aston Villa then came in and offered double the wages Arsenal were offering, and the still teenaged Keown left for the Midlands. The clubs couldn’t agree a fee, so as was the case in those pre-Bosman days a tribunal decided the amount of the transfer. You wouldn’t catch Arsenal not paying a youngster enough these days! 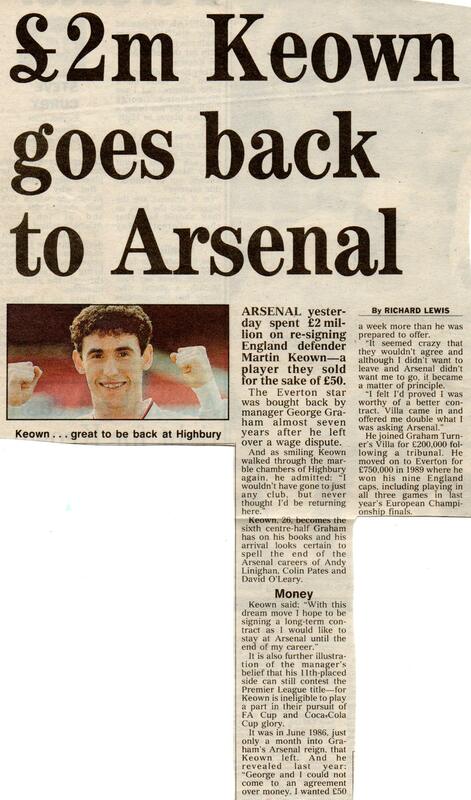 Not George’s best bit of business, and Keown was also cup-tied for the two trophies we were still actively pursuing that season. Never mind; it all worked out in the end. Not George’s best bit of business? 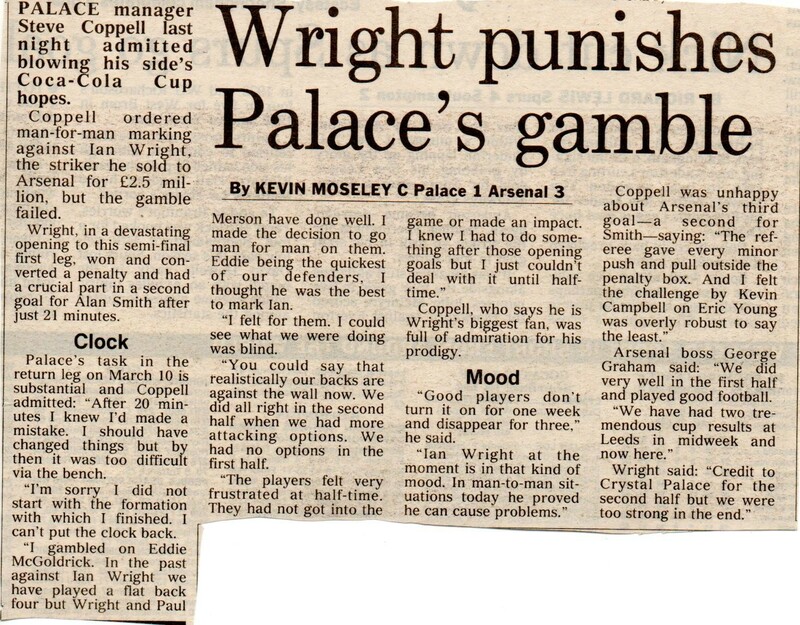 He went and trumped it big time in the summer by signing the player that Ian Wright ran rings around that day. At least he only paid £1m for McGoldrick. Mind you, Eddie was about a twentieth as useful as Keown, so worse value I suppose.